The city’s beautiful skylines, great buildings and iconic sidewalks create stunning photography and illustrations for what is not surprisingly one of our most popular wallpaper categories - New York wallpaper. It is home to some of the most famous buildings in the world, the greatest museums and the best food from around the world, making it a diverse range that can find a place in any space. Below, we look at some of our huge collection of New York wallpaper and how you can use them in your home. We’ve also included some facts about the places shown in the murals below, just for fun. 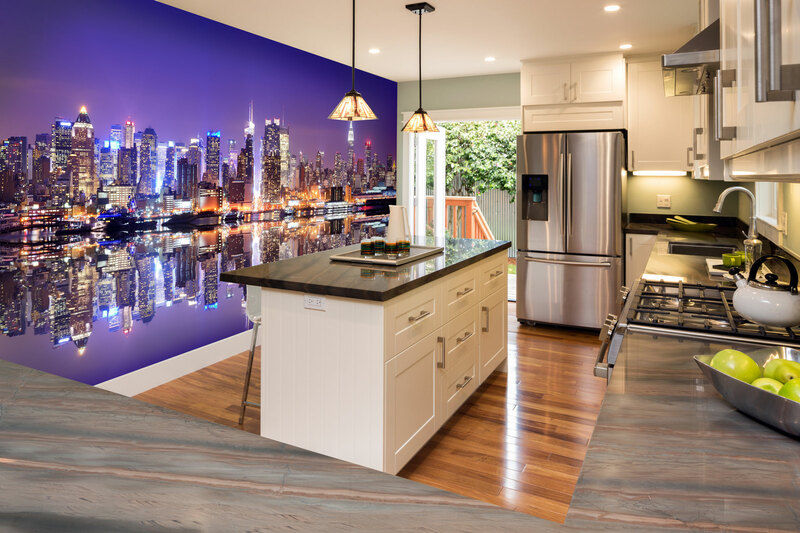 You’ll feel as if your living room is at the heart of the Upper East Side with this New York wallpaper that creates the appearance of a window that overlooks Manhattan. The yellow colours of sunrise add an uplifting touch to the image, whilst the buildings that stretch far out into the distance will create the illusion of a larger space. 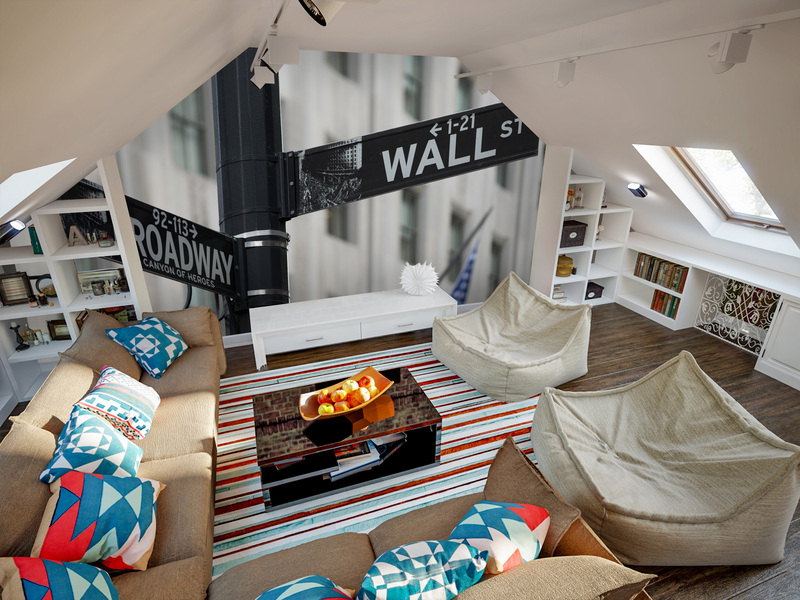 This New York wallpaper is a great choice for upgrading a small and cosy living room. The subtle colour palette means that it blends easily with most decor styles, giving you the freedom to fit it in with your current decor. This wallpaper would also work well in a kitchen, dining room or home office. Manhattan; did you know? There’s approximately 1.6 million people, 24,000 eating establishments and 200 modern art galleries alone in Manhattan alone. Source: Movoto, Open Table and New York Census. 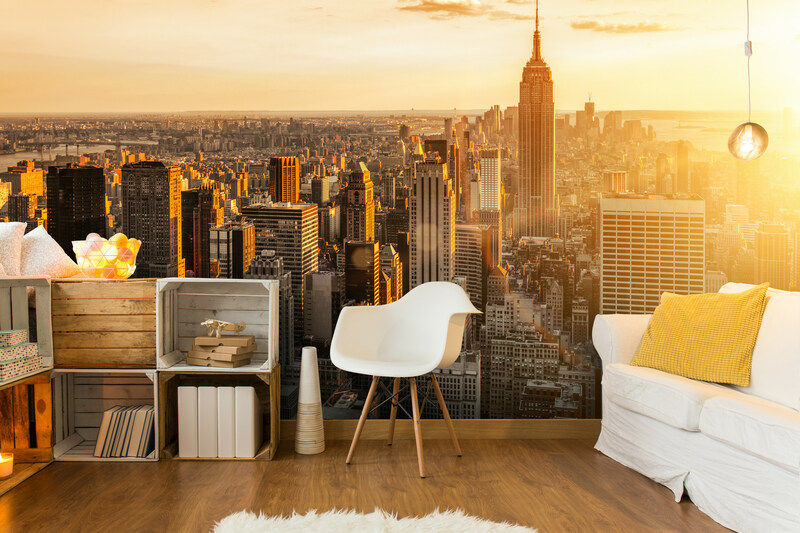 This New York wallpaper will create a stunning feature wall that won’t become outdated, whilst still looking modern and complementing both contemporary and classic decor. The rich colours work well with the solid colours typically found in the kitchen and will add a dash of something special to your kitchen decor. If you spend a lot of time in the kitchen, this wallpaper is the perfect way to ensure that you look forward to preparing every single meal! New York; did you know? Brigton beach in Coney Island (a popular holiday destination for New Yorkers) was named after Brighton, UK. Looking for a New York wallpaper that’s a little different? Get a real slice of New York in your home with this wallpaper of the iconic Wall Street and Broadway street sign. It’s one of the things most synonymous with New York and the casual photography will help to create an urban look which is perfect for apartments, lofts bedrooms and spaces to relax in. The muted colours mean that this New York wallpaper can be mixed with bright colours, giving you the freedom to decorate the rest of the space however you wish. Broadway; did you know? Although there's 40 Browadway theatres, only four are actually located on Broadway. Broadway used to be the home of most theatres but they have since spread around the surrounding avenues. 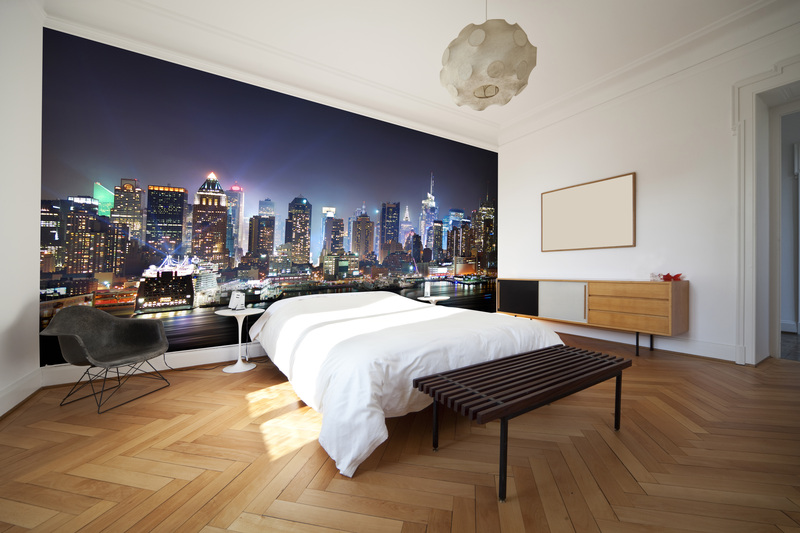 This gender neutral New York wallpaper takes things into the bedroom with a night time skyline. It’s our favourite New York wallpaper for the bedroom as the deep colours create a romantic and relaxing atmosphere. The impactful photography makes this a perfect backdrop for a bed and a beautiful setting for binge watching your favourite TV box sets! Did someone say Friends marathon? 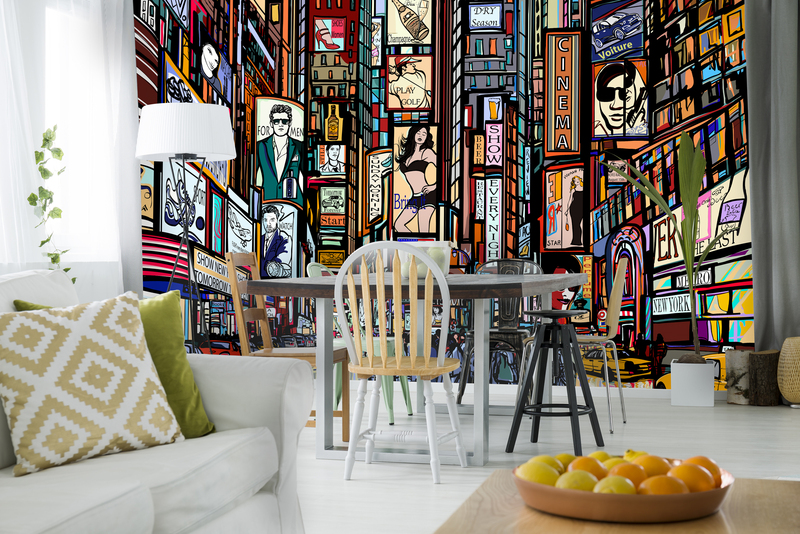 This abstract illustration of Times Square will create a vibrant setting that complements any room in the home. We especially like this New York wallpaper for dining as the bright streets create the feel of dining outside amongst New York’s finest restaurants. This abstract wallpaper will also make a great feature wall in a bedroom or living room. Times Square; did you know? Times Square was renamed in the early 1900's after The New York Times set up headquarters there. It used to be called Longacre Square.